Photo by Mark Chamberlin Nabil Nasr: the remanufacturing industry is poised for growth. For much of the last two centuries, Northeastern cities like Rochester saw their local economies and work forces transformed by manufacturing. Rochester, a manufacturing powerhouse on its own, produced and even created items that changed how Americans lived. From buttons to caskets to cameras and copiers, this area's factories churned out a staggering range of products. But by the mid 1970's, many of Rochester's factories had either downsized or shuttered their doors. While manufacturing is not what it once was in Rochester, a rather inconspicuous but related industry has emerged. And it's dramatically changing the way products are produced in the 21st century. "Remanufacturing" in its simplest form is the process of taking old and used products and determining which parts are suitable for reuse, says Nabil Nasr, director of the Rochester Institute of Technology's Golisano Institute for Sustainability. "You're taking something that has been used for a while, and back at the factory, you're disassembling everything to the component level," he says. "Through a similar process that was used to create the original product, we assess the condition of each of the components. The components that are worn or non-functional are replaced, and the product is reassembled." The "reman" industry is poised for major growth, Nasr says, and the opportunities for RIT and Rochester are significant. RIT's Golisano Institute for Sustainability and the Remanufacturing Industries Council will host a two-day business roundtable for leaders in the field on Thursday, April 11, and Friday, April 12. The event is intended to provide business leaders, students, and researchers the latest reman information, though the roundtable is open to the general public. To register: www.remancouncil.org. Remanufacturing is not a new concept, Nasr says. "The first industrialist to establish a serious remanufacturing company and really use it was Henry Ford," Nasr says. "Ford discovered that a lot of his cars were coming back when the engine reached the end of its life, but the rest of the car's parts were in good shape. And then, after further examination of the engines, he discovered that they, too, [had] so many viable parts that were absolutely fine to use for another cycle." A lot has changed since Ford's early reman applications in the 1930's. US production of remanufactured goods totaled about $43 billion in 2011, up from $37 billion in 2009. And the industry employed nearly 200,000 full-time workers, according to "Remanufactured Goods: an Overview of US and Global Industries, Markets, and Trade," a report by the US International Trade Commission in Washington, DC. US exports of remanufactured goods climbed to $12 billion in 2011, up more than 50 percent from 2009, the report says. Nasr says the industry is much larger, however. "By my estimate, it's over $100 billion because they did not include all of the different [business] sectors," he says. "For example, the Department of Defense remanufactured the B-52. The B-52 is over 90 years old." Remanufacturing is now being used by companies in virtually every major business sector, but the automotive, medical device, and aerospace industries account for more than 50 percent of the industry. Toner cartridges for copiers are a good, recognizable example of remanufacturing Nasr says. The products were quite innovative when they were first introduced into the marketplace, he says. "All the toner was in one place, and when you were done, you could throw the cartridge away," he says. "You're not touching the toner, it's not messy. But hundreds of thousands of them were ending up in landfills." And the used cartridges contain residual toner, which is harmful to the environment. But some companies have discovered value in the used cartridges: they can be taken apart, the worn parts replaced, and the cartridge refilled with toner. What used to be trash, now has economic value, Nasr says. The product is cheaper than a new cartridge, he says, and environmental damage has been reduced. "The key thing to remember is that as a society our consumption rate is going up and up," Nasr says. "There was a report the other day that said the increase in the middle class of China, India, and other countries is contributing tremendously to this rapid increase in consumption." Another force behind the growth of the remain industry is the advancement of technology, Nasr says. "Our ability to develop better and better products is quickly shrinking the lifespan of those products," he says. "If you look at a cell phone, for example, if you say you're going to use a cell phone for more than two years, people will look at you in shock. The advancement in features is so great within a two-year period that it makes it difficult for us to say, 'I'm going to use this for a long time.' It's uncommon and it's not practical." But remanufacturing shouldn't be confused with simply salvaging old parts, Nasr says. And reusing older parts doesn't mean there's a loss in quality, he says. "It sounds like there is a compromise here, but in reality we don't make any compromises," he says. "The remanufactured product will be identical to the new product." Remanufacturing also offers other distinct advantages. It reduces the demand for raw materials caused by consumption, and it reduces damage to the environment often associated with manufacturing. For example, many parts and the hazardous materials they frequently contain will often end up in landfills and waterways if they aren't remanufactured, Nasr says. "Reman is typically half the price of new and leaves a significantly lower footprint on the environment," he says. "In my view, it is the silver bullet to allow us to think about what we just made, still advance to a newer product, but not throw away all of the cost of fabrication and consumption that went into something in the first place." Nasr has been working in the field for more than two decades and says he never imagined that remanufacturing would become the industry it is today. 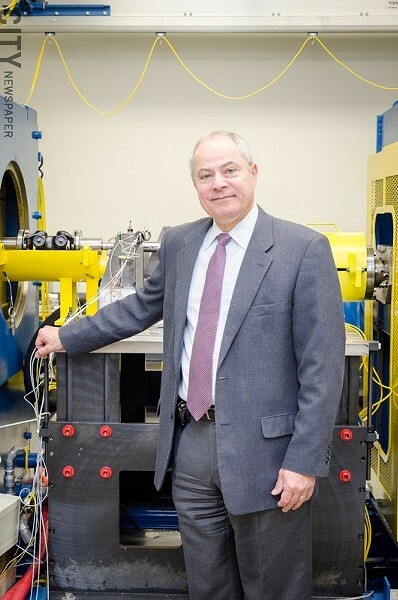 Rochester already has some of the most significant companies in the industry, he says, and RIT plays a major role in remanufacturing's innovation and growth. "Except for our program here, there aren't many [university] programs that teach reman," he says. "We're [Golisano Institute for Sustainability] the only center in the world today focused on remanufacturing. We are a technology development-technology transfer organization. We're teaching the world about this."